NESTLE GOFREE CORN FLAKES for a tasty gluten-free start to the day. Deliciously crispy flakes of golden corn cereal. Contains 6 vitamins and minerals including iron. No artificial colours or flavours. Certified gluten-free by Coeliac UK. Certified Kosher. Promotional packs are subject to availability, while stocks last. We cannot guarantee that your delivered pack will carry a featured promotion. Rediscover the joy of gluten-free cereal with NESTLE GOFREE CORN FLAKES breakfast cereal. Our deliciously crispy flakes of golden corn cereal have all the taste, just without the gluten. Made from carefully selected ingredients, fortified with 5 vitamins and iron, and no artificial colours or flavours. 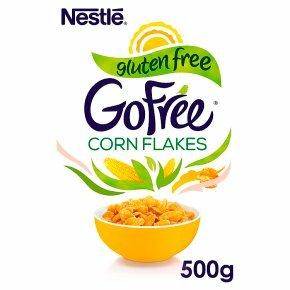 NESTLE GOFREE CORN FLAKES are a gloriously gluten-free start to your day, without the normal gluten-free price tag! Meaning no more compromising at breakfast. Discover gluten-freedom with GOFREE - so good you won't leave a gluten-free bit! Serve with cold or hot milk, and why not try with fresh fruit and yoghurt.